This almost became part of the WIP theme, but I finally finished it last night. It is a summer placemat. 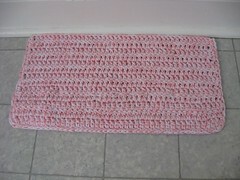 I used white Red Heart yarn, pink Caron’s Simply Soft yarn, and a K hook. I made a little boo boo in the bottom left corner. I made it too long, so I tucked it under the side and single crocheted around the edges to keep it tucked behind the back. Oops! 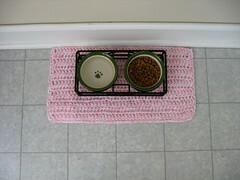 It is actually for my cat, Drusilla, and she doesn’t mind. Just curious, Was the name for your cat gotten from “Buffy The Vampire Slayer”? Yes, Stormy! She is a black cat and when she puts her head back all you see are her white fangs. The name fits her perfectly, plus Drusilla was always my favorite character on Buffy. how SWEET! Leo would love one of those…he’d be able to get his claws into it too.